Apple has officially released iOS 8.1.2 Firmware (Build: 12B440) for iPhone, iPad, iPod Touch and Apple TV. 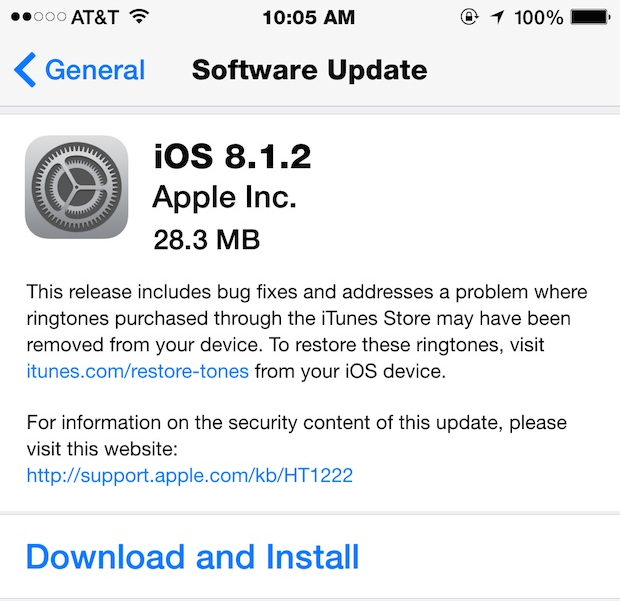 The latest iOS 8.1.2 Update is instantly available for installation / update / upgrade purpose to general public. The official Direct Download Links of iOS 8.1.2 Firmware for iPhone 6 Plus, iPhone 6, iPhone 5S, iPhone 5C, iPhone 5, iPhone 4S, iPod Touch 5G, iPad Air 2 6G, iPad Air 5G, iPad 4G, iPad Mini, iPad Mini 2, iPad Mini 3, iPad 3G, iPad 2G and Apple TV 3G are posted for our readers and followers below. Apple iOS 8.1.2 (Build: 12B440) Firmware release notes includes; "Bug fixes, Fixation for ringtones purchased from iTunes Store, Addition of new features and functionalities, Performance improvement etc." You can read more changes and features of iOS 8.1.2 HERE and in below image! How to Manually Install iOS 8.1.2 Update? Apple iDevice users can get iOS 8.1.2 OTA Update (Over-the-Air) automatically via Settings > General > Software Update option. Apple iOS developers and non-developers (general users) can install iOS 8.1.2 via iTunes. You just need to Download iOS 8.1.2 IPSW via Direct Links available below. Whereas, iOS 8.1.3 Firmware Update release is also expected in this month. How to Jailbreak iOS 8.1.2 Firmware? You can Untethered Jailbreak iOS 8.1.2 Using Taig Jailbreak Tool on iPhone, iPad and iPod Touch. Just follow Tutorial and Guide HERE.